The Comet Pan-STARRS will be 28 million miles (45 million kilometers) from the surface of the sun when it swings around the star today, and should be bright enough to see without the aid of telescopes or binoculars, weather permitting. But the comet is also appearing low on the western horizon at sunset so some planning is needed to spot the celestial wanderer with the naked eye tonight. "Look too early and the sky will be too bright," said Rachel Stevenson, a NASA Postdoctoral Fellow at the agency's Jet Propulsion Laboratory in Pasadena, Calif. "Look too late, the comet will be too low and obstructed by the horizon. This comet has a relatively small window." Comet Pan-STARRS, officially known as comet C/2011 L4 Pan-STARRS, was discovered in June 2011 by astronomers using the Panoramic Survey Telescope and Rapid Response System (or PAN-STARRS), a telescope atop the Haleakala volcano in Hawaii. The comet takes more than 100 million years to orbit the sun and appears to come from the Oort cloud, a vast halo of comets and icy objects at the outer edge of the solar system. While the comet is making its closest pass by the sun tonight, the best views of the object are still to come. NASA scientists said the comet's proximity to the sun may make it too difficult to spot tonight, but that will change over the next few days. "As it continues its nightly trek across the sky, the comet may get lost in the sun's glare but should return and be visible to the naked eye by March 12," JPL officials explained. "As time marches on in the month of March, the comet will begin to fade away slowly, becoming difficult to view (even with binoculars or small telescopes) by month's end." And there is another reason to look for comet Pan-STARRS later this week. On Tuesday (March 12), the moon rises into the cosmic display. "The comet will be joined in the western sky after dark by the slender crescent moon on March 12, 13, and 14," the editors of StarDate Magazine, a stargazing publication of the McDonald Observatory at the University of Texas. "Good naked-eye views of the comet should continue for several nights, with the comet remaining visible through binoculars into April." 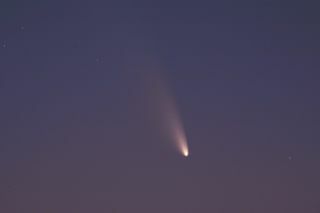 Comet Pan-STARRS is one of three comets capturing the attention of stargazers this year. The Comet Lemmon C/2012 F6 is currently visible to observers in the Southern Hemisphere and at times was in the night sky at the same time, allowing stargazers to capture rare photos of two comets in the sky together. Meanwhile, the Comet ISON is making its way into the inner solar system and could put on a spectacular cosmic display later this year. Officially designated C/2012 S1 (ISON), Comet ISON was discovered in September 2012 by Russian amateur astronomers Vitali Nevski and Artyom Novichonok using a remotely operated International Scientific Optical Network (ISON) telescope. Some astronomers have billed Comet ISON as a potential "comet of the century" since it could be brighter than the full moon in daylight when it makes its closest approach to the sun on Nov. 28. At that time, Comet ISON will be much closer to the sun than Comet Pan-STARRS is now. ISON will approach within 800,000 miles (1.2 million km) of the star, making it a true sungrazing comet.